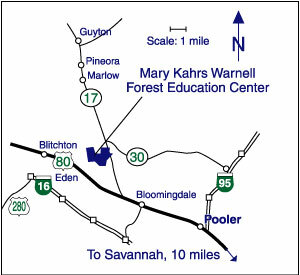 The Mary Kahrs Warnell Forest Education Center is open to the public from 8 a.m. to 5 p.m. Monday through Friday. However, reservations are required for any facilitator-lead educational programs. We request that you return the enclosed Program Request Form two (2) weeks prior to the date you wish to visit the Center. This will give us ample time to prepare a program that meets the specific educational needs of your students. All educational programs are provided at no cost. Be aware that this could change at any time. Please notify the Center Director as soon as possible if you must cancel your reservations or if your arrival time will be delayed. Inclement weather, except in severe cases, should not hinder programming at the Center. While we wish to conduct as many programs as possible in an outdoor setting, we have an exceptional indoor learning facility that can be utilized if needed. Please realize that this may affect the program schedule we have prepared for your class. We require that you bring at least one adult chaperone for every ten students in your group. Proper attire is necessary for the comfort and safety of your students. We suggest loose fitting, comfortable clothes and footwear. Jeans and boots or sneakers are good options. Sandals and open-toed shoes are strongly discouraged. Also be sure to bring jackets or coats on cool or cold days. Additional items such as hats, sunglasses and insect repellent may also add to the comfort of your students. Food service is not available at the Center. If you plan on visiting the Center over a lunch hour, students will need to bring their own lunches or you will need to arrange to have food provided for them. We do have a kitchen area with a refrigerator, stove, and ice-maker that you are welcome to use during your visit. Please notify the Center Director if you plan on arranging for food to be delivered to the Center.